If you’re looking to make a colorful statement in your living room, why not consider using stained glass Tiffany style lamps for added vibrancy and brightness. These intricately styled lighting fixtures can be a focal point of any room, whether you opt for a table lamp, floor lamp or swag style. 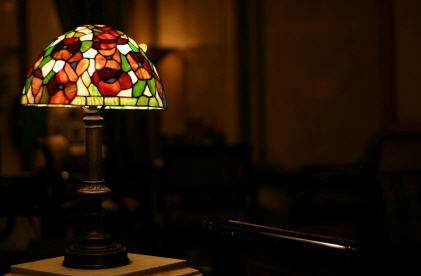 Keep reading to learn more about stained glass lamps and how to use them in your home. Although many of today’s stained glass lamps are modeled after the classic style of the original collection of Tiffany lamps, there are many modern variations that make it easy to find one to fit your decor. If your living room is decorated in warm neutrals, then a couple of colorful, intricately patterned table lamps would be perfect to add some welcome color to the room. On the other hand, if you already have a lot of color and patterns in the room, there are several stained glass lamps that are quite subdued, such as the white jewel styles. These lamps are entirely white, but still feature the stylish patterns and designs associated with traditional Tiffany lamps. One of these lamps on an end table and another as a floor or swag lamp would be a wonderful accent to a colorful room. The great thing about stained glass lamps is that they come in so many different colors and designs. You’ll have no problem finding one that complements your living room. The baroque table lamps are ideal for a formal living room in neutral earth tones. The dragonfly lamps tend to be highly colorful and will look stunning in a room with cooler colors like white, grey and blue. If you have a wildly contemporary decor with lots of black, glass and chrome, why not add an accent lamp in rich red jewel tones to provide the perfect contrast.